Home » Talk of the Town Washington D.C.
Peckar & Abramson, P.C. (P&A) is pleased to announce the elevation of attorney Chris Sweeney to the position of Senior Counsel and the promotion of Alexandra Busch to Senior Associate. Chris Sweeney represents clients in litigation and alternative dispute resolution proceedings related to the construction of multi-million-dollar structures and facilities, both public and pri-vate. He frequently represents clients in the construction of power facilities, and his clients in-clude major EPC and design-build contractors, general contractors, subcontractors, suppliers, and sureties. Chris is experienced in drafting and negotiating contracts and subcontracts, analyzing contract documents and advising clients of potential pitfalls before construction starts. He is also a civil engineer, with a dual focus on structural design and construction project management. Chris earned his B.S. in Civil Engineering from Worcester Polytechnic Institute and his J.D. from University of Maryland School of Law. 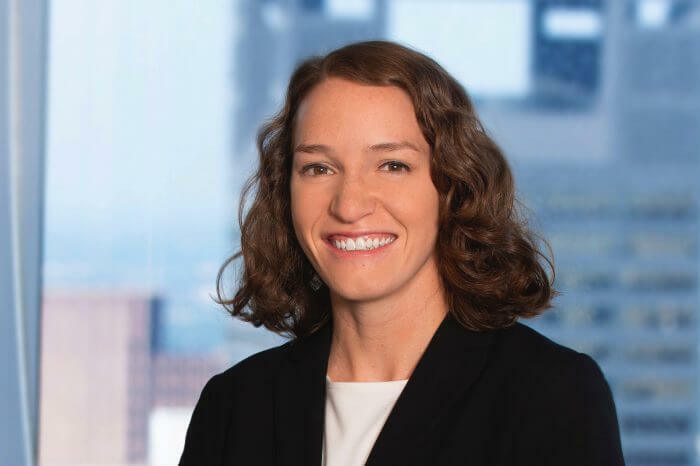 Alexandra Busch represents a broad range of national and international commercial clients across the construction industry, including owners, general contractors, subcontractors, and sureties. Using her experience with the various stages of litigation, Alexandra excels at advocating on behalf of her clients at all times throughout the dispute process. She earned her Bachelor of Science from James Madison University and her J.D. from George Mason University School of Law, where she focused her studies on civil litigation and gained experience in construction and government contracts law. About Peckar & Abramson P.C. Peckar & Abramson, P.C. maintains offices in New York City, New Jersey, Washington D.C., Miami, Chicago, Oakland, Los Angeles, Austin, Houston, and Dallas, and has affiliations with global firms in Latin America (through its founding membership in CONSTRULEGAL), Lon-don, China and India. In addition to its core construction practice, the firm has affiliated practice groups who counsel contractors on labor and employment matters, corporate and regulatory compliance issues including D/M/WBE compliance and general corporate and real estate matters.